What is the Salary Range for a Chef? How Many Chefs Are Nationally Employed? Where Are Most Chefs Employed? What are the Overtime Laws for Chefs? What is the Overtime Rate for a Chef? Chefs usually work for restaurants and direct and may participate in the preparation, seasoning, and cooking of salads, soups, fish, meats, vegetables, desserts, or other foods. They may also plan and price menu items, order supplies, and keep records and accounts. Depending on the work setting and state, the U.S. Bureau of Labor Statistics (BLS) noted that in 2016, 80% of chefs made between $23,630 to $76,280, with the average annual salary being approximately $43,180. A former cook and bouncer for a Flagstaff, Arizona sushi bistro recently filed an unpaid overtime lawsuit against the company over allegations that the restaurant’s owners failed to properly pay him for all his hours spent on the job. AUSTIN — A chef working in a Texas hospital recently filed an unpaid overtime lawsuit against her employer claiming the health care provider misclassified her as overtime exempt and owe her back wages. Under the FLSA, employers may be required to pay its chefs overtime. Typically, chefs oversee the daily food service operation of a restaurant. Depending on the employee’s education, job duties and whether or not they create new food dishes, they may be exempt from the overtime laws of the FLSA, meaning not able to collect overtime wages. As a result, it is extremely important you consult with an experienced chef overtime pay laws lawyer. At our top rated law firm, we will determine whether or not you are eligible to file a claim under the law. If determined that you were unfairly denied wages, we will start working on your case immediately gathering all the evidence to prove and win your case. The overtime rate of pay for a chef is one and one-half their regular rate of pay. In order to calculate the number of hours a cook worked overtime, the employer must consider all required work performed both before and after a shift, any scheduled meal breaks, staff meetings, and required paid training. Additionally, hours worked overtime also include hours worked at all facilities and departments or on-call, and the regular rate should include shift differential, bonuses or on-call fees. Yes. There have been numerous FLSA class action lawsuits filed to insure chefs are paid what they are owed. An class action lawsuit is a claim filed by an entire group of chefs against their employer for payment of back overtime wages. Therefore, if multiple employees at the same business have unpaid overtime claims, they may be able to file a collective Wage and Hour action to recover their wages. Wage and Hour lawsuits can be filed as an individual lawsuit as well. 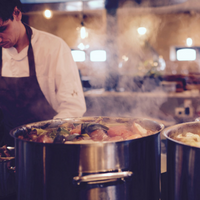 The FLSA provides chefs the right to a file private action against an employer which means the lawsuit is brought by one employee against the employer and other similarly situated workers have no involvement in the case. There are strict time limitations for filing a claim so it is important that you discuss your case in a timely manner. If you wait too long, you may lose your ability to recover some or all of your back pay. An experienced chef overtime pay attorney can determine whether you are entitled to overtime wages based upon your job description, job duties, rate of pay, and number of hours worked. Some states have their own overtime pay laws that may be slightly different from the FLSA with respect to overtime pay for chefs. An experienced overtime pay attorney can determine whether you are entitled to overtime wages based upon your job description, job duties, rate of pay, and number of hours worked. There are strict time deadlines for filing lawsuits so it is essential that you contact an attorney immediately. To determine whether you are eligible for filing a wage claim, contact our experienced chef overtime pay lawyers at (855) 754-2795 for a Free Consultation to discuss your case or complete the Free Unpaid Overtime Case Review Form on this page. We will discuss your situation and determine if you have a claim. If you are owed unpaid wages, we will represent you under our No Fee Promise, which means there are never any legal fees or costs unless you receive a settlement.